A while ago now I was lucky enough to win £20 to spend on a Craftsy class, in a hashtag competition run by Hélène Martin of CORA fame. 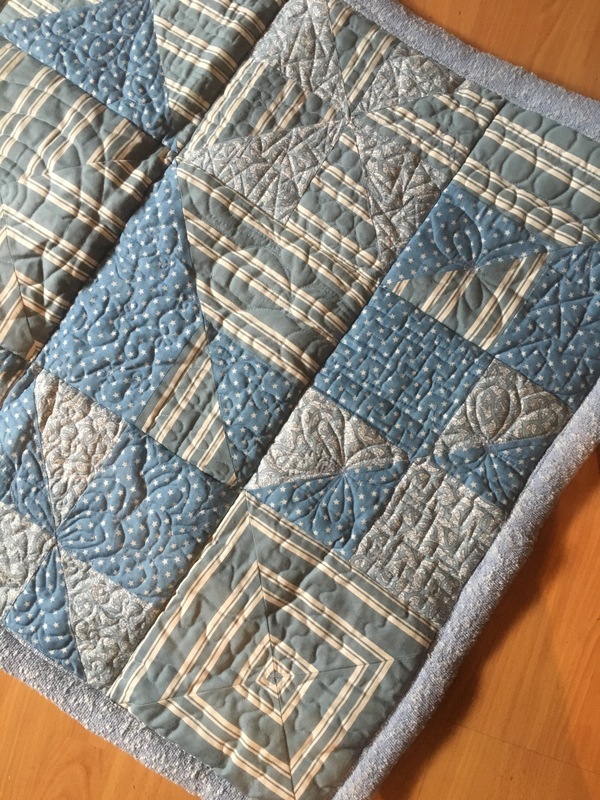 I chose something I’d never done before, something that would take my sewing skills and make me use them in a totally different way… Free Motion Quilting. 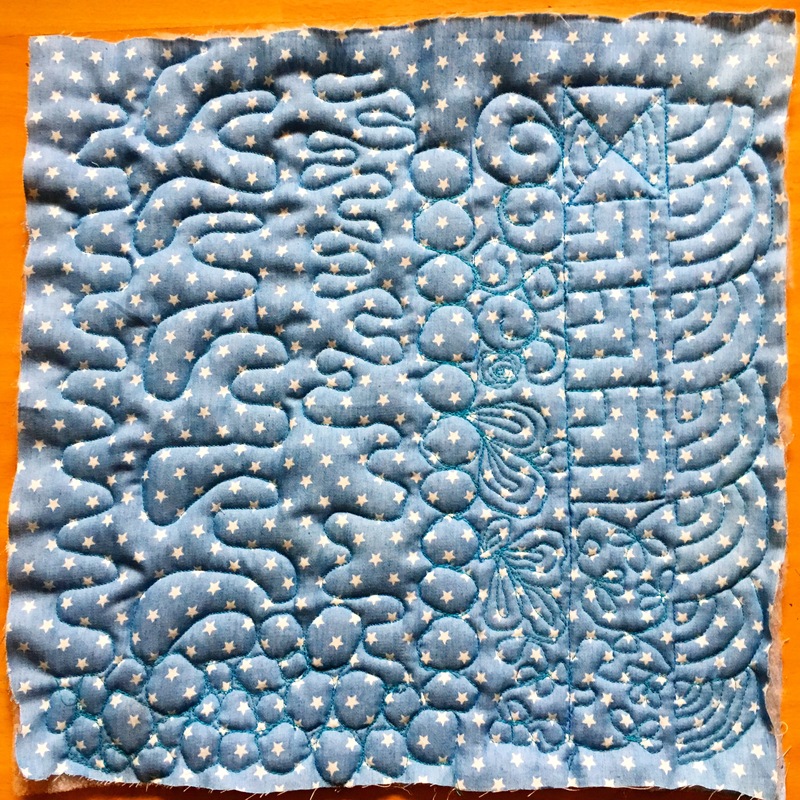 As I started watching my Craftsy class (Free motion quilting a sampler with Leah Day) I realised that I had a heck of a lot more to learn about quilting before I got to free-motion. 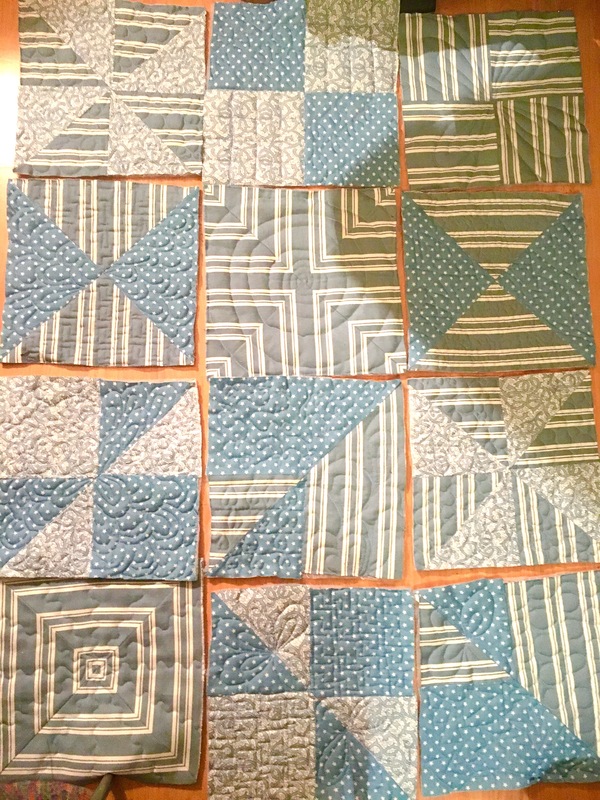 I diligently started researching piecing and block designs. There are (of course) so many videos and tutorials on line. Quite confusing in fact, so I found THIS SITE and bookmarked it as it seemed to contain more than enough ideas and instruction to keep me going. It wasn’t the easiest thing, but there were enough non-panic moments to encourage me to keep going. After a few more sandwiches I’m going full steam ahead with this first quilt. It’s getting gifted no matter how it turns out. One thing that it seemed quite clear would be of use to me was a ‘Supreme Slider’ to help everything move a bit more easily under my machine. 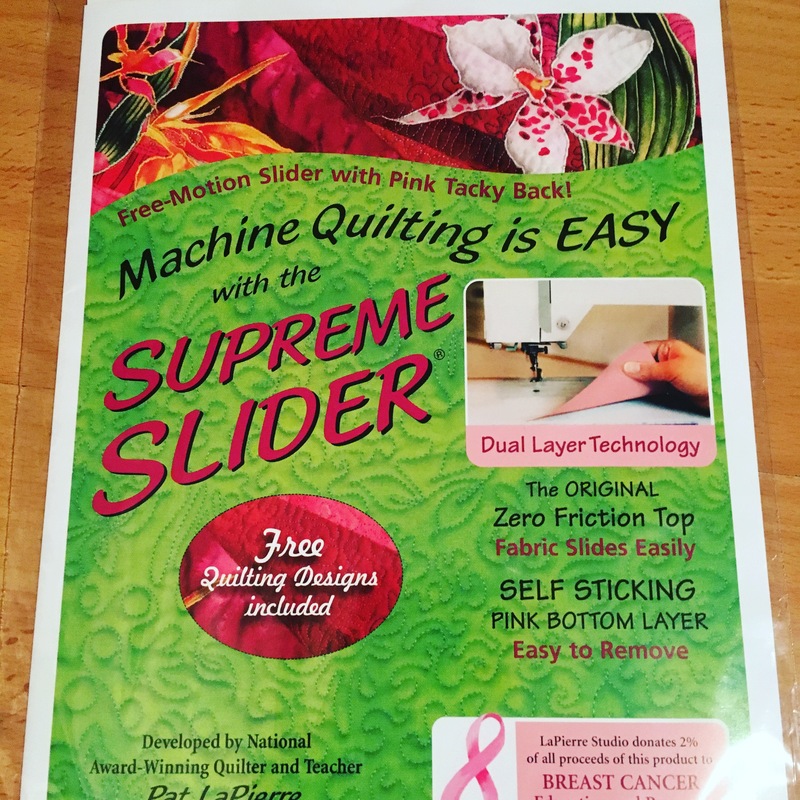 There’s no way to tell at this point if the smoothness will be improved with practise or gadgets, but I know which one is quicker to attain… so a few days later my supreme slider arrived. I think it helps. Yes, it helps. I’m such a total amateur at this though that I need all the help I can get. Maybe it would have rocked my world more if I’d already been free-motioning without one for years? I’m loving Leah’s course, both content and delivery. However, as is often my wont, I’m not following it properly. 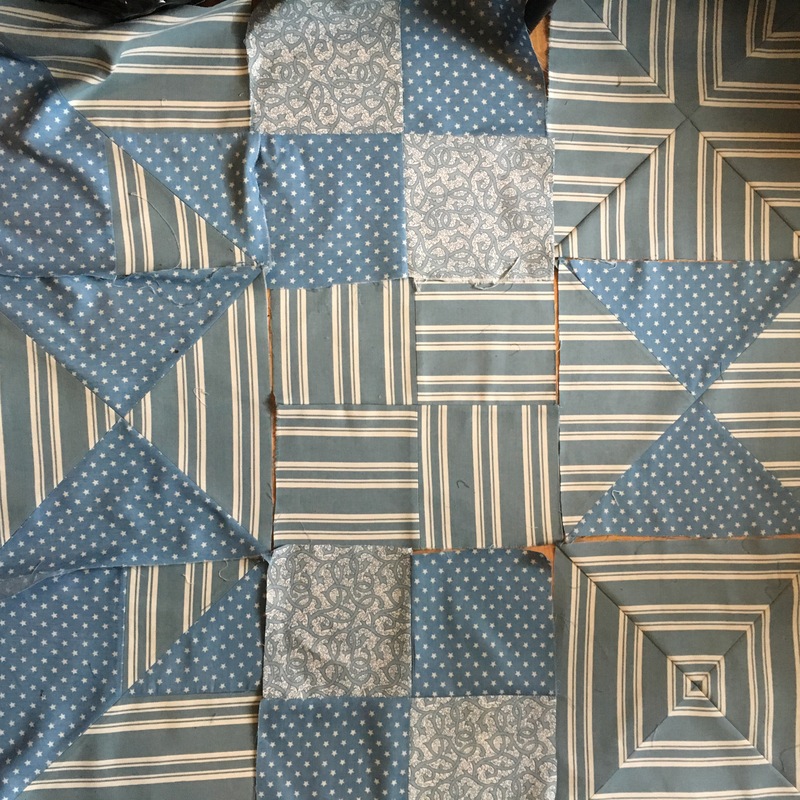 I’m not making her quilt, I’m making (for better or worse) my quilt. I’m sure I could pick up most of the information I’m getting somewhere on line for free too. But I’ve discovered that one of the lovely things aboout using a Craftsy class is that you get all the information you need from one person, in one go, when you want it, without the frustration of watching lots of the wrong videos first. I’m not sure I’ll pay out for one myself, but it’s a very nice treat and I feel incredibly spoilt. Make and quilt each panel in seperate sandwiches as Leah instructs and fix them together with her clever binding trick (which appears to rely heavily on a degree of accuracy which I am not yet sure I can deliver). Quilt each piece seperately with a thin batting, sew them together then do the backing in one go & stitch in the ditch to hold it together before binding. 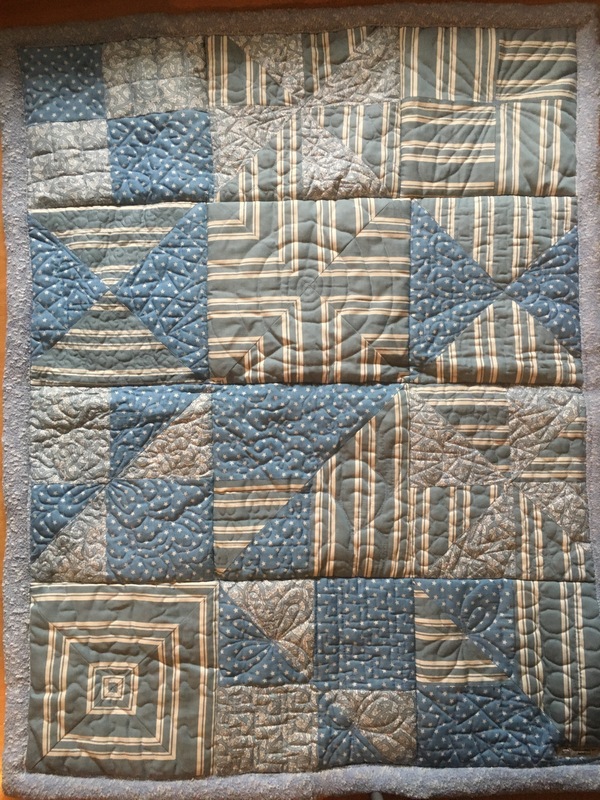 The freemotion quilting is terrible, I’m sure, so please look away if you are easily offended. I just sat and did it all in one night. In fact, in about 2hrs, with no thought as to what the finished designs would look like or how they would sit together. I started with swirls, circles and stippling… went straight on to straight-line stippling… had a go at a sort of paisley design, hearts, Greek-keys, spirals… you name it… I was unstoppable! As you can see, it doesn’t really line up very well and overall looks a bit of a mish-mash, but I’m really happy with it. We’ve all got to start somewhere, right? After sewing it all up, I cut another piece of wadding to fluff it all up a bit and sandwiched that between my quilt and backing fabric. I stitched in the ditch if the big squares to hold it all together. 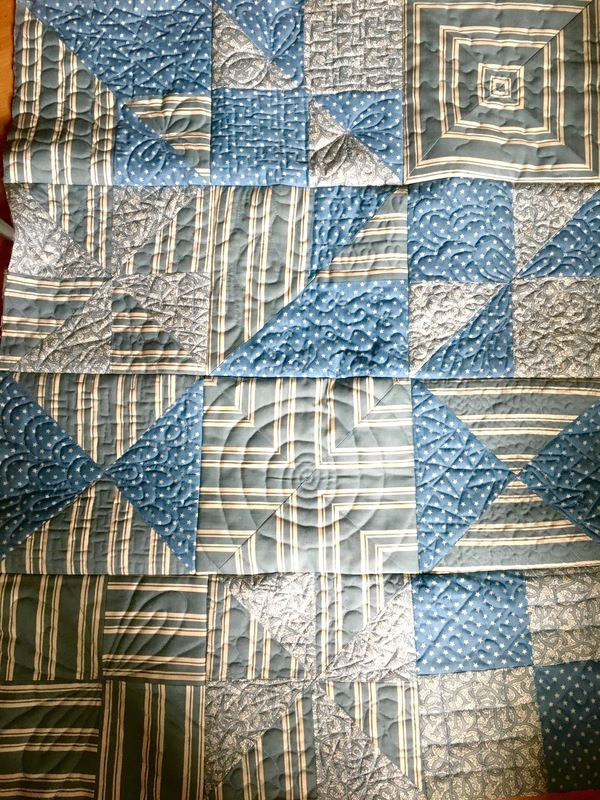 Unlike its recipient, the quilt is far from perfect. I’d go as far as to say that it is technically a mess! But I’m really happy with it, and hopefully it will be loved and used for many years. Make sure all the blocks are the same size in future! Don’t beat yourself up, it looks great! Does this mean I will never throw any scraps away ever again…?! What a beautiful quilt. The fabric combinations are well chosen. What a lovely idea. 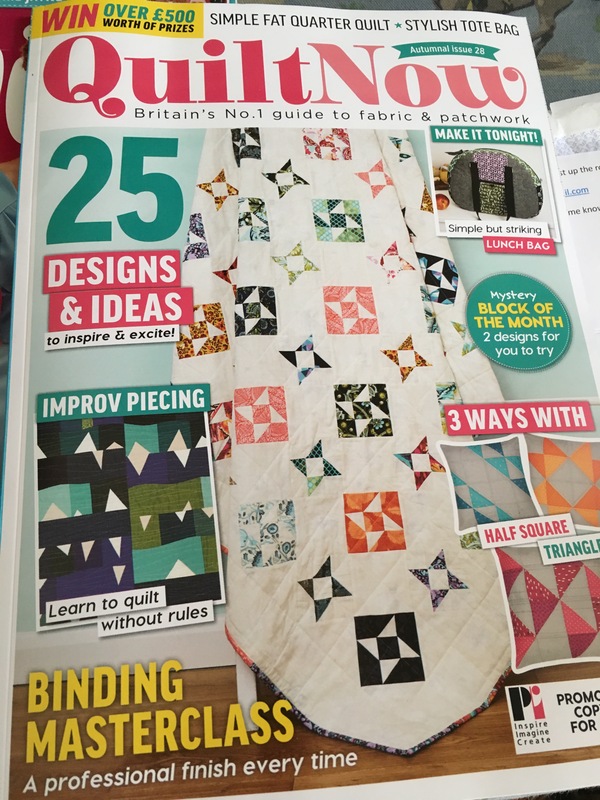 Sadly I think – as much as I enjoyed it – my quilting ‘skills’ will be on a back burner for a while now. I thought I’d be fussy with it, but, I guess the deadline (& a couple of beers!) – he came 2 weeks early! – helped me switch that off for a few hours…?! This is wonderful! 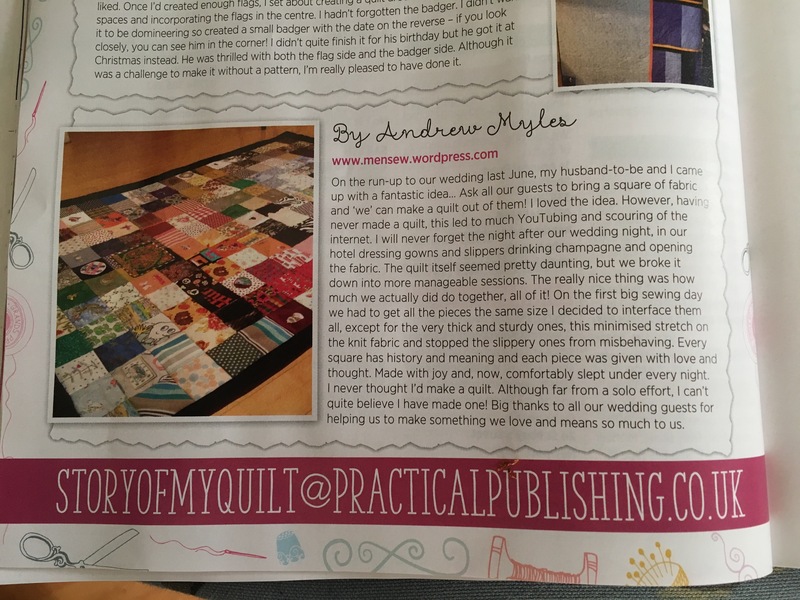 I’m so delighted to have helped you on this quilting journey. Honestly, I think your attitude of jumping in without a worry for perfection was the absolute best way to do it. 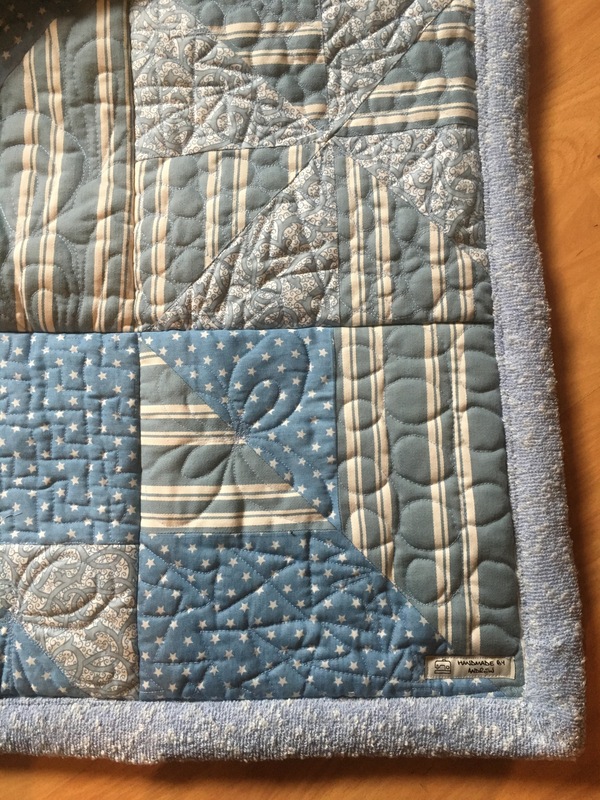 So many quilters build awesome piecing skills and get every single seam just exactly right, but then end up too afraid to free motion quilt it because it might “ruin” the quilt. Going into this with a Get Er Done attitude is the PERFECT way to learn. 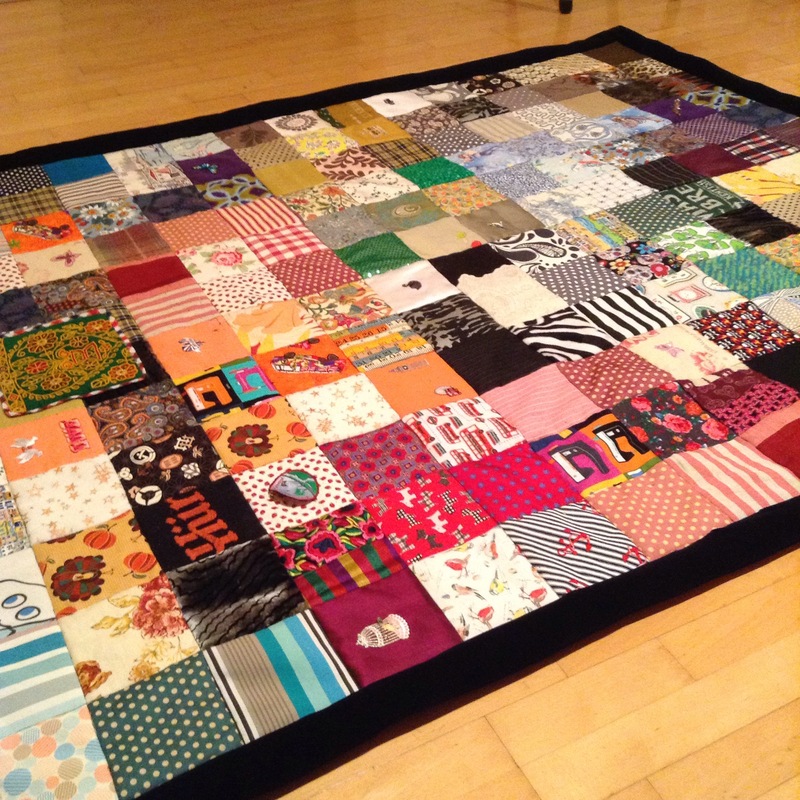 And I learned something from you – that third method of putting your quilt together is genius! Not only does it hide a potentially messy back to the quilt, it is also much faster than my binding method. Thank you! Wow! I’m thrilled you got something out of it too!! That’s unbelievable!